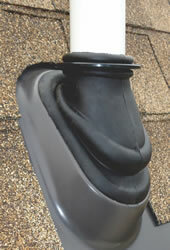 awesome products, as a homeowner I have suffered many times replacing the wimpy pathetic “standard” pipe flashing. I replaced all my four year old flashings immediately after learning about your flashing. Any roofer who knows about your flashing and chooses not to use it is dishonorable to his clients. I refuse to buy that Chinese crap any more. It’s insulting. I make the flashings here and once I retire no one will know how to do it….we’ll need your part, hell we already need it. It’s a thing of beauty, and now in all conscience, after finding it, you can’t really use anything else. Stop telling everyone else about your boots, I’m serious. I want to be the only one who has them. We have built over 500 homes and track our call backs. Roof boot failure is in the top 3. I would like to start showing this product to my homeowners to set ourselves further apart from the competitors. Once you know about yours, how could a decent roofer use anything else? Now, the home builders are requesting that we only use the Ultimate. I absolutely love your pipe boot products and still trying to convince everyone to go to this as part of a “Best Practice”. Thank you sooooo much for the Pipe Flashing!!! I was you tubing how to install a pipe flashing and came across this video: https://youtu.be/dfliETAVTeI. He mentioned your product. I purchased this product and couldn’t be happier! WAY WAY WAY better than that crap I saw at Home Depot! Seriously! I’m a firm believer that you get what you pay for. And I wasn’t disappointed this time. Thank you! This is all we use since we first seen them! It doesn’t make since to put on a lifetime roof with a 10 Year pipe collar. Yours is perfect! Just replaced all the flashing on my house. Product seems very well built and designed. Definitely looks like it will outlast any other solution I have seen! Replaced a crusty old copper pipe with pvc and your flashing. Hasn’t leaked a drop since! My wife installing one of the 1.5″ flashings on our roof! I consider the Ultimate Pipe flashing the best new product in roofing since ice dam barrier. We use Ultimate Pipe Flashings on every whole roof replacement and pipe flashing repairs that we make….there is no comparison to the traditional pipe flashing and our customers deserve the best! 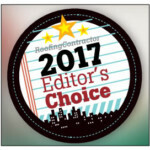 316L STAINLESS STEEL ULTIMATE PIPE FLASHING Roofing Contractor Award Winner! 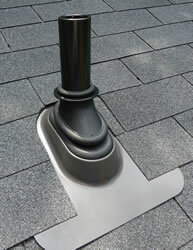 The Ultimate Pipe Flashing® for the Life of your Roof! SquareLock™ technology forms an I-beam structure with incredible hold. Certified Almag 35 does not corrode or break.